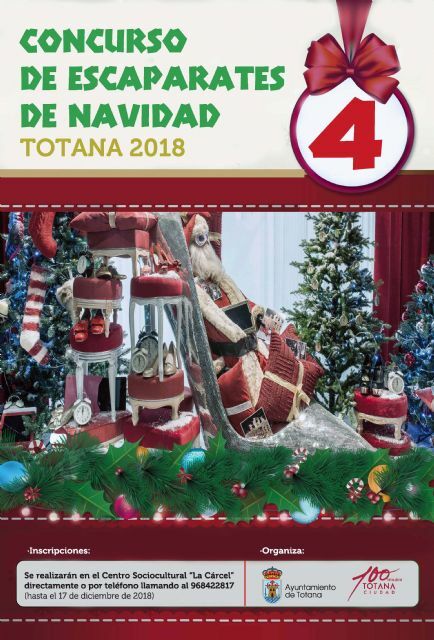 The inscriptions to participate in the IV Christmas Showcase Contest organized by the Department of Culture of the City of Totana for this year 2018 can be made until December 17 directly at the Sociocultural Center "La Cárcel" or by calling 968422817 or 659949937. This contest aims to promote the creativity of the merchants when it comes to presenting their establishments and products during the next Christmas holidays, so that they are more attractive for neighbors and customers, while contributing to create a special festive atmosphere in the streets of the municipality. and the decoration must have a direct relationship with the atmosphere typical of those Christmas holidays. in which the artistic creation (originality, ingenuity and artistic wealth), materials used, composition and effort or diligence in the execution of the works will be evaluated. Several prizes are established: 150 euros (first prize), 100 euros (second prize) and 50 euros (third prize). The award ceremony will take place on December 20, at 7:00 pm, at the award-winning establishment.